Elon Musk, the entrepreneur nerd icon, unveiled the grand underground vision of his brainchild, The Boring Company, which will give a facelift to all your transport shenanigans. Musk hosted The Boring Company’s first public Information Session on Thursday at Leo Baeck Temple in LA. The presentation centred around reformed bricks, a model 3 engine in a locomotive, an update on flamethrower delivery, and the most groundbreaking was the all-electric loop shuttles. Project leader Steve Davis and Musk shed light on the various details of the underground network and how the project could alleviate the traffic problems and de-congest big cities. Elon Musk’s Boring Company is working to offer a network of interconnected tunnels to provide smooth and efficient commuting in LA which is frequently marked by “soul-destroying traffic”. Musk’s mission is around the idea of moving people or things in pods or Loop-carts to destinations as fast as possible. According to his telling, the Loop ride could carry up to 16 passengers who’ll be shot at a 150 MPH speed through an underground network of tunnels spread across the city, that too at a measly cost of $1. This is actually different from the Hyperloop which would be used for relatively long distances clocking near supersonic speeds. The major problem can be drilling those crazy tunnels. The tunnel-boring process is slowed down significantly by drilling and reinforcing the tunnel and simultaneous removal of the dirt displaced by the tunnel. The company is working on solutions and Musk already mentioned bricks that were made by compressing dirt at high pressures, with a mix of concrete. Recently, Musk showed off a completed 2-mile concept tunnel in Hawthorne. The tunnel is dug by Godot, the company’s first boring machine, and begins in the parking lot of SpaceX’s headquarters. Elon Musk’s tunnel vision is bound to transform the mass transit with fast and economical travel. The 150MPH in-city Loop carts are all-electric which means zero emissions, and interestingly, it will cover the distance from Downtown LA to LAX in just 8 minutes. A major concern can be hitting speeds that don’t compromise the comfort of the people inside. Musk even offered free rides to test the tunnel to get public feedback. “It’ll be like a weird little Disney ride in the middle of LA. Bring your flamethrower,” Elon said. The LA Metro has become an important ally to The Boring Company after it agreed to a ‘partnership’ with Musk’s Loop venture on Thursday before the meeting. The news came just as Elon Musk announced that he wants to link The Boring Company’s Hyperloop technology with SpaceX’s rockets to reach anywhere on Earth in less than an hour. The electric transportation system will undoubtedly result in a major shift in the transportation ecosystem. It is a just a matter of time when the world will see, and LA would experience, the concerted and consistent efforts of Musk materialize. The internet payment maven-turned-carmaker-turned-space enthusiast-turned-infrastructure baron is known for his futuristic flair. 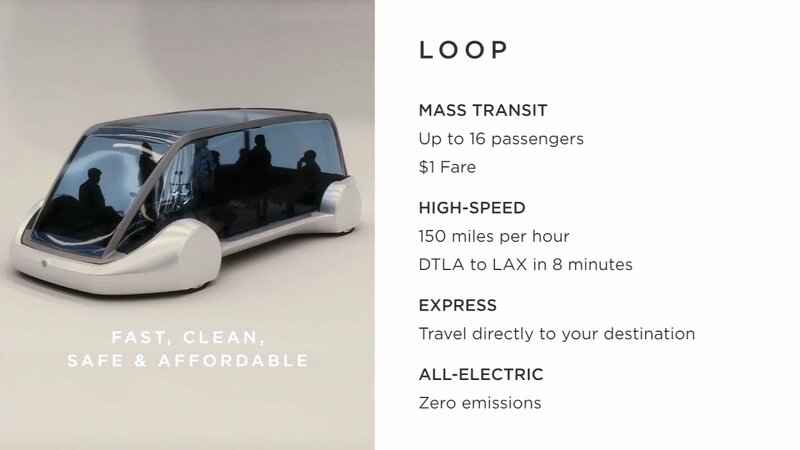 Musk seems adamant on cost-saving and energy efficient methods of travelling, as he told that The Boring Company has also made a battery powered electric locomotive that uses the engine from Tesla Model 3.